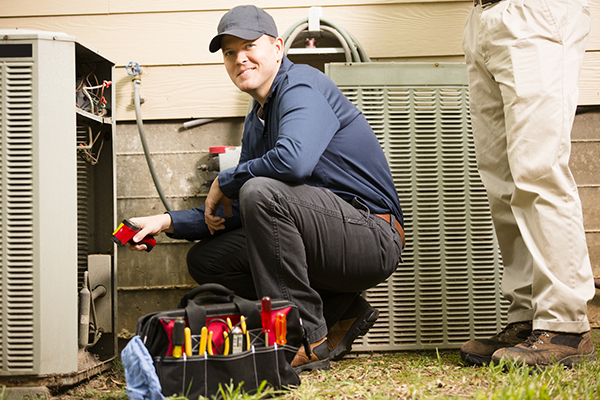 As one of Houston’s most qualified air conditioning service companies, Courtesy Air Conditioning & Heating has certified HVAC technicians on standby to help you with any sort of problem with your AC unit, day or night. Our team has been trusted by homeowners in the Houston area for over 25 years. There is absolutely no reason you should not be cool and comfortable in your home. Courtesy Air Conditioning & Heating can help take care of your AC issues any time day or night, even on weekends. We never charge an overtime fee- just a reasonable price for the services performed. If your air conditioner stopped working, call the expert technicians at Courtesy Air Conditioning and Heating to inspect your AC unit. The problem may be relatively simple, such as a clogged air filter, or a broken condenser. Most repairs can be made with the tools and parts we carry in our service trucks. If the issue is more than a simple repair, your best option may be installing a new energy efficient air conditioner. The new AC Replacement units can save you quite a bit of money on energy bills, as well as give you peace of mind knowing your brand new system will provide several years of efficient service. We have great prices on new AC units! For AC units 5 years and older, Courtesy Air Conditioning and Heating recommends you schedule an annual air conditioner inspection to catch little issues before they turn into major disasters. The basic inspection includes taking a look at the AC unit itself, visible ductwork, the filter, and the condenser. In addition, an inspection may also include a temperature reading from various registers to make sure the system is running efficiently. Some of the more common problems we fix immediately include: clogged filters, electrical problems, thermostat issues, and low coolant. By taking care of these problems now, homeowners will have to worry far less about an older AC unit giving out at night or on a weekend. Call Courtesy Air Conditioning & Heating for the best prices and expert AC Service and Repair on all makes & models in Houston, Huffman, La Porte, Hockley, Cypress, Barker, and the surrounding areas. For immediate relief from the heat, call (713) 278-9933. FREE Estimates!